After much fan anticipation, Image Comics is pleased to announce that Nate Simpson's NONPLAYER, which achieved massive levels of critical acclaim upon its debut, will return with the highly anticipated issue #2 on June 3, 2015. In order to meet customer demand, NONPLAYER #1 will return for a third printing and be available on April 1. Newsarama calls Russ Manning Award-winner Simpson "a superstar in the making," and Warren Ellis says of Simpson, "this guy's going to be a big deal. The whole thing is just a f****** stunning piece of illustration." Multiversity raves that NONPLAYER is "a deafening roar that no one can ignore. Simpson has created the debut of the year with this comic, and to pass it up would certainly be the biggest mistake any comic fan could make." NONPLAYER is set in the future—and the future is dismal. That goes double for Dana Stevens—she's stuck in a dead-end tamale delivery job, and she's way too old to be living with her mom. But Dana escapes to the online fantasy world of Jarvath, where she's an elite warrior. When she slays the wife of celebrity game character King Heremoth, her victory seems all but guaranteed—that is, until the game spins wildly out of control. Issue #2 sees a wounded King Heremoth plotting revenge against Dana, while a police standoff at a Los Angeles fish market reveals a homicidal robot armed only with seafood. Simpson outdoes his beautiful and multi-layered debut with an even more ambitious feat of world-building! NONPLAYER is a lush and vivid story that explores what happens when one girl loses herself in an escapist hobby that turns out to be much more than just a game. 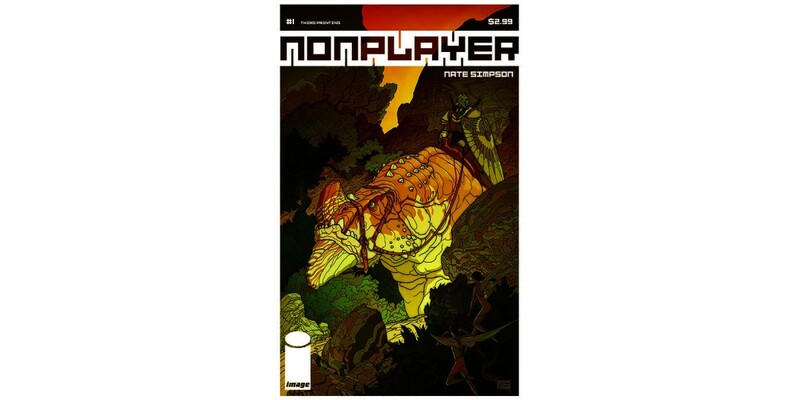 NONPLAYER #1, 3rd printing (Diamond Code = JAN158233) will be available on April 1. The final order cutoff deadline for retailers is Monday, March 9. NONPLAYER #2 (Diamond Code = APR150542) will be available on June 3 and can be pre-ordered now.